Digital disruption was once seen as an opportunity for businesses to capitalize on changing consumer behaviors caused by the Digital Age. Now, this is no longer an optional transformation, but a vital process to connecting with audiences through fully optimized channels of communication. In fact, this has become so prevalent, consumers are no longer willing to wait for brands to adapt to their digital behaviors, and instead will move on to brands who are more digitally adept. According to Salesforce, because of this, $1.6 trillion was lost by businesses whose customers switched to competitors because of the company’s digital savviness. 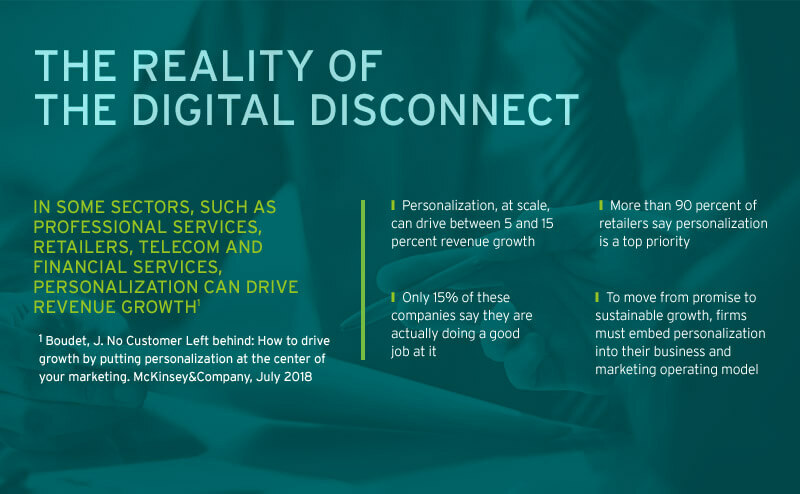 Business leaders much understand how to guide their customer interactions using the key factors cause by digital disruption, or lose revenue due to the poor customer service experiences of a digitally disconnected message. Data Foundation: Build a comprehensive view of the customers in real time. A better foundation of customer data will allow you to truly personalize your brand’s digital experience and customer service, which will allow you to compete in today’s markets. Design: Create the right offers at the right time with the right messages at speed. If a customer has just landed on your brand’s website and is immediately asked to sign up for a newsletter, chances are they’ll click out of that pop-up, and may even bounce from the site. You haven’t given them a chance to get to know you. Understand where your customers are in their journey and getting to know you and your value-add, then send them the messages tailored for that point in the journey. Distribution: Deliver and measure the experiences across your platform and build feedback into your data foundation. Understand your own digital success is paramount to improving. The more you realize why customers are or are not converting, opting in, or filling out that web form, the more you can change to improve. 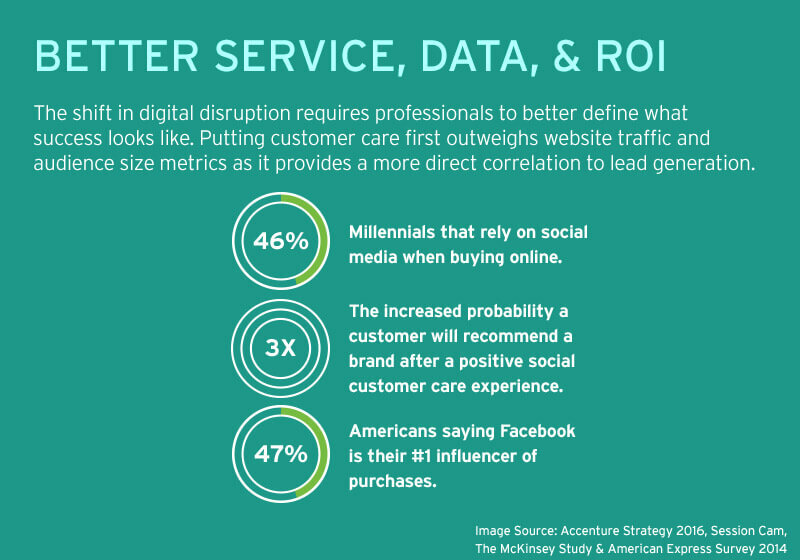 The customer service experiences through digital personalization and social interactions with brands are key factors to meeting these expectations to retain their trust and business. To extract maximum value, integrate these elements and design your offers in direct response to your customers’ signals in real time. 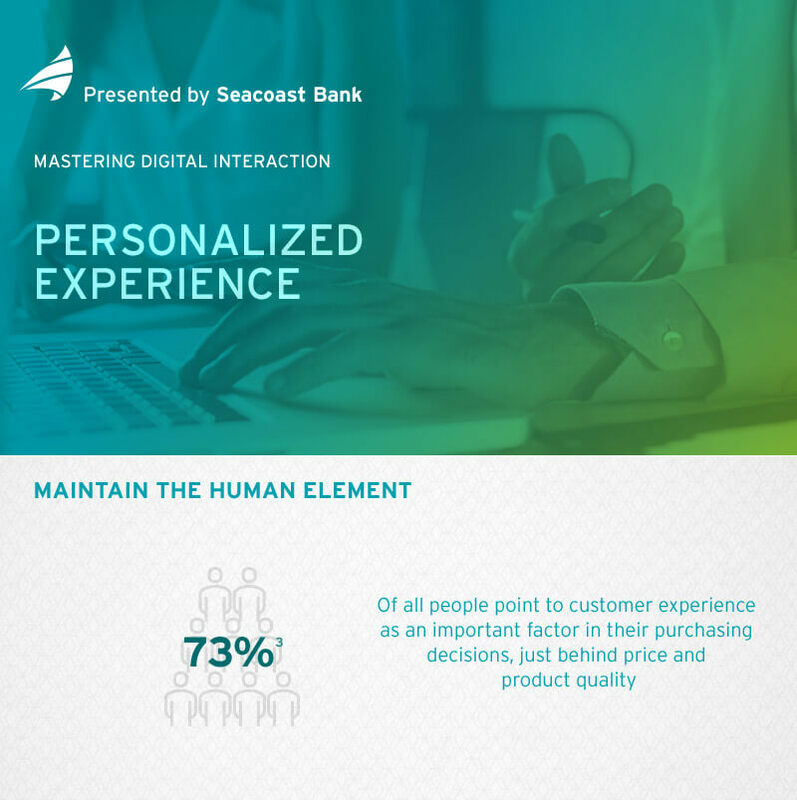 Providing the target audience custom experiences isn’t a new approach to business interaction, however digital communicators utilize the right digital and social opportunities to create more than one touch point of interaction. The progressive application of customization provides a more accurate ROI outside of traditional interactions like link clicks, and allows a clearer picture of the market’s actual needs. 73% of all people point to customer experience as an important factor in their purchasing decisions, just behind price and product quality. Make it clear to users that your digital efforts are people-oriented. Utilizing digital communication that is “live” displays a heightened customer service that consumers find valuable. Collecting information through personal interaction online is not just intriguing for customers, but provides a more detailed level of the user’s information. This analysis is used to improve current marketing channels, product enhancements, and provide better experiences in the future. 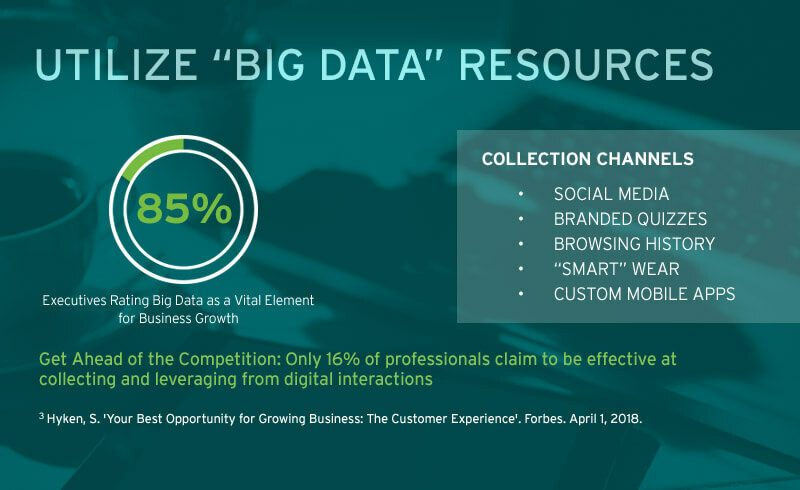 According to Forbes, while 85% of executives rate big data as a vital element for business growth, only 16% of professionals claim to be effective at collecting and leveraging from digital interactions. Meaning, there is a huge opportunity to become the brand that is the expert at collecting and leveraging data for a better online experience for your customers. The shift in digital disruption requires professionals to better define what success looks like. Putting customer care first outweighs website traffic and audience size metrics as it provides a more direct correlation to lead generation. 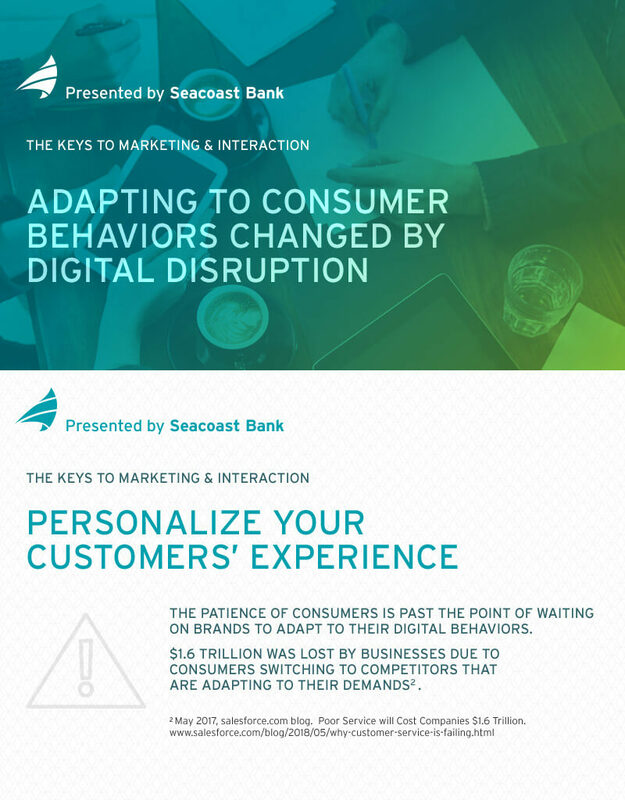 Digital disruption causes customers to take multiple paths to achieve brand interaction. The answer for genuine connection that matters isn’t always in giving them variety, but the reassurance of a consistent presence and location that hey can count on. Opening channels to benefit from multiple levels of integrations will further these efforts, making the digital disruption effect work in your businesses favor. Do you already have a list of targeted accounts? 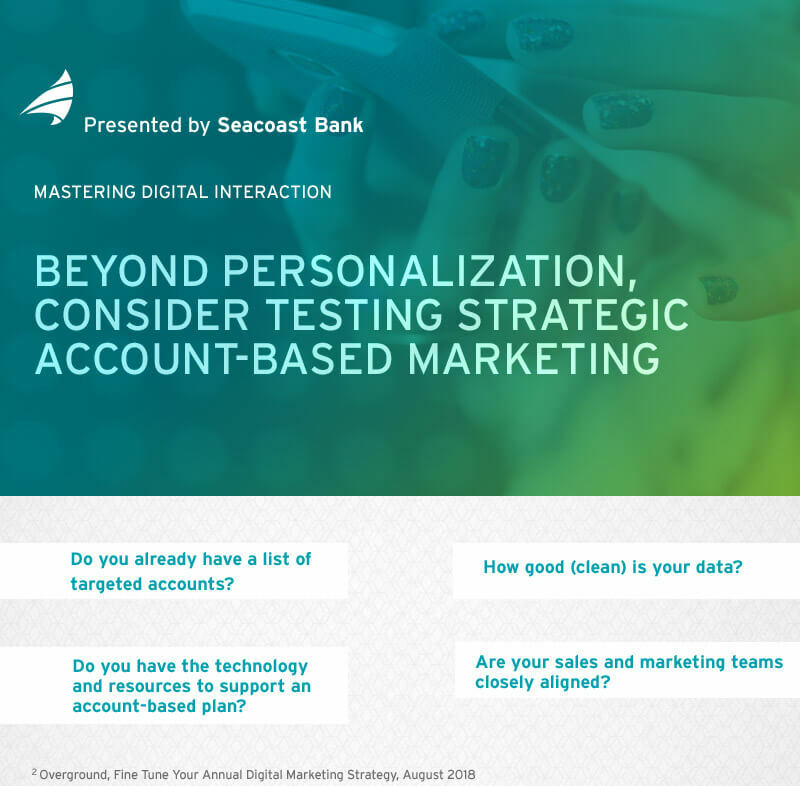 If yes, an account-based focus could help your sales team penetrate those accounts faster and improve marketing’s contribution to revenue. How good (clean) is your data? Do you have the comprehensive, updated contact information for key decision-makers at your targeted accounts? Do you have the technology and resources to support and account-based plan? For an account-based plan to work, you need to see Key Performance Indicators from revenue to customer lifetime value to sales engagement and activities. Are your sales and marketing teams closely aligned? It is a familiar adage, but sales and marketing need to be connected at the hip on campaign strategy, content delivery, customer follow-up and execution for your plan to be effective. 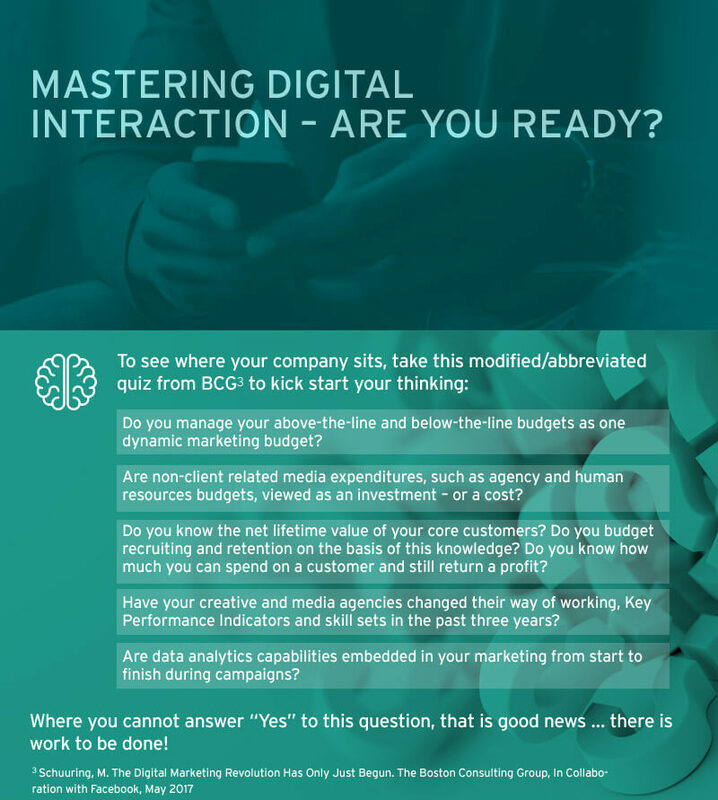 Mastering Digital Interaction – Are You Ready? 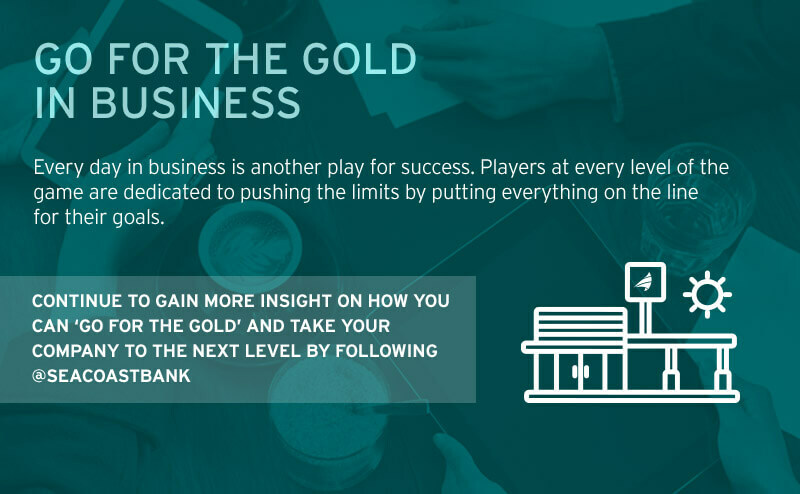 Finally, consider this from the Boston Consulting Group (BCG). 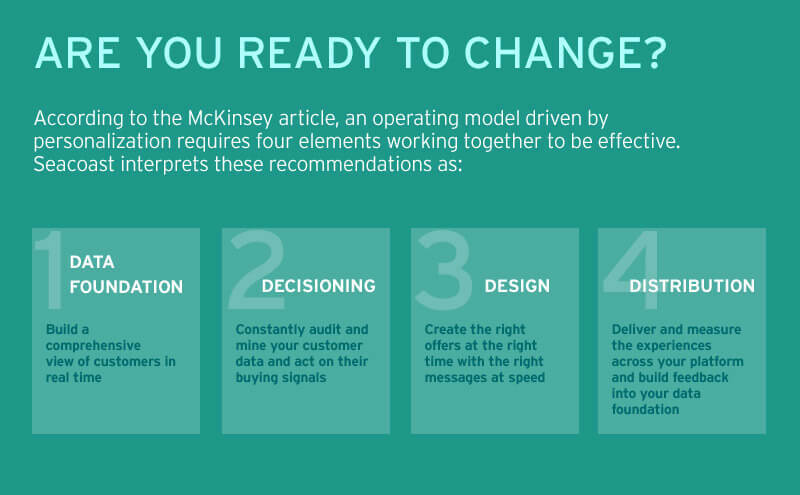 Many companies are making changes to adapt to emerging customer demand for personalized marketing, but few are building the competencies inside their organizations from the ground up. To fully capitalize on the opportunity provided by digital marketing, your business must build the competency into your operating DNA. Take a look at the short quiz above. Did you answer “No” to any of the questions? That’s actually good news because it means you have room to grow! Use that quiz as a starting point for understanding changes you can begin to make to begin mastering digital interaction. To become a master digital communicator in the modern age all comes down to emphasizing how custom and collaborative technology work in tandem to create experiences that matter to the target audience. Moving beyond the idea of simply implementing the newest technology or building a presence on the most popular channels allows a more valuable and clearer conversation between brands and their target audience. Leveraging the advances of the digital age only comes when companies use digital and social innovation as an opportunity to get to know them first, and encourage transactions later. We’ll ensure you’re comfortable with the right products for you, as well as the team that will work with you, from day one. 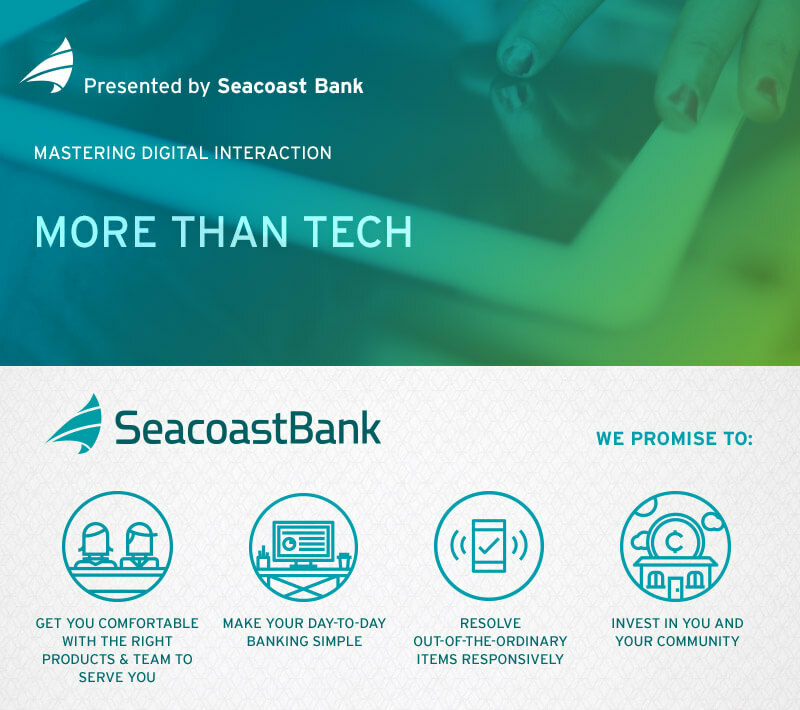 We’ll use all the tools at our disposal to make your day-to-day banking as simple as it can be. If you encounter out-of-the-ordinary problems, we’ll work with you to handle them quickly. We’re a local bank and intend to stay that way. Because of that, we’re able to promise to invest in you and your community.